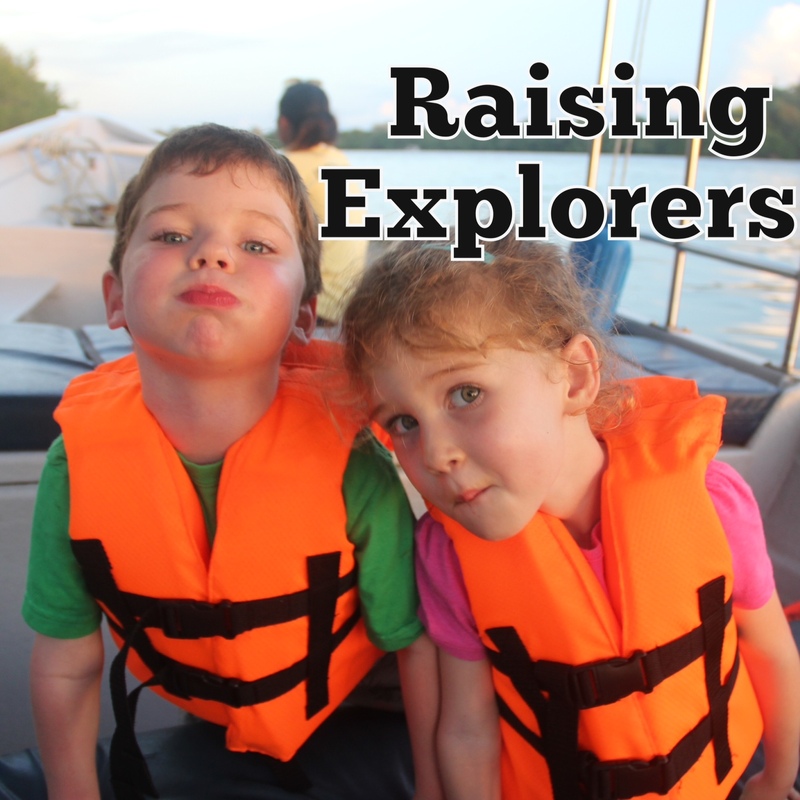 I am presenting at the English Teachers’ Association of NSW Annual Conference 2014 next weekend on class blogging. For the participants (and those of you who can’t make it) I have set up a quick reference “How to” about setting up a class blog on edublogs.org. 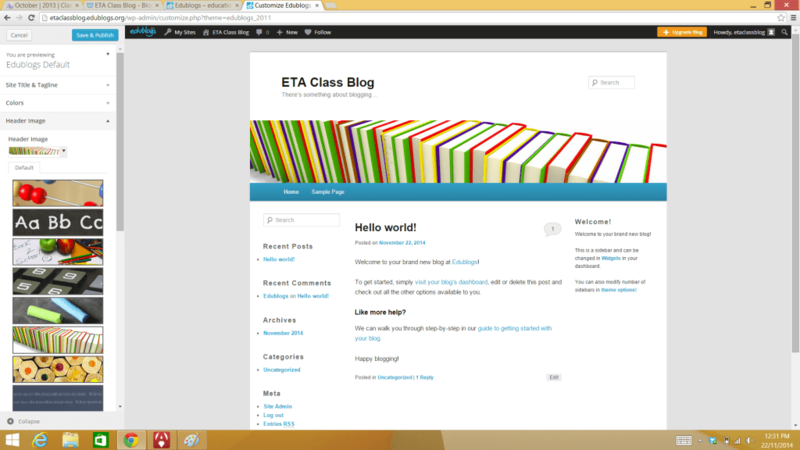 This is also on the sample blog site that I created for the workshop: etaclassblog.edublogs.org. Tip: Think about asking your class what they’d like to call the blog. Run a comp. to find the best title that fits your class. 4. Choose your theme by clicking on “Appearance” and then “Themes”. 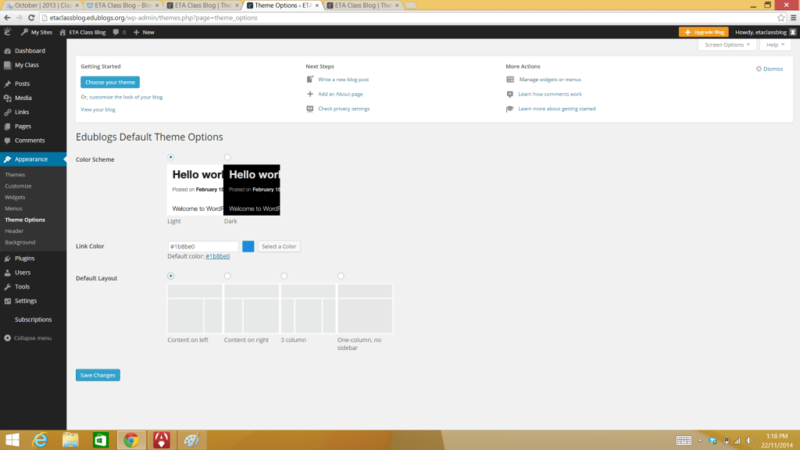 Once you have chosen your theme, click on “Customise” to choose your colours and images. Edit your site title and tagline, and choose a header image. 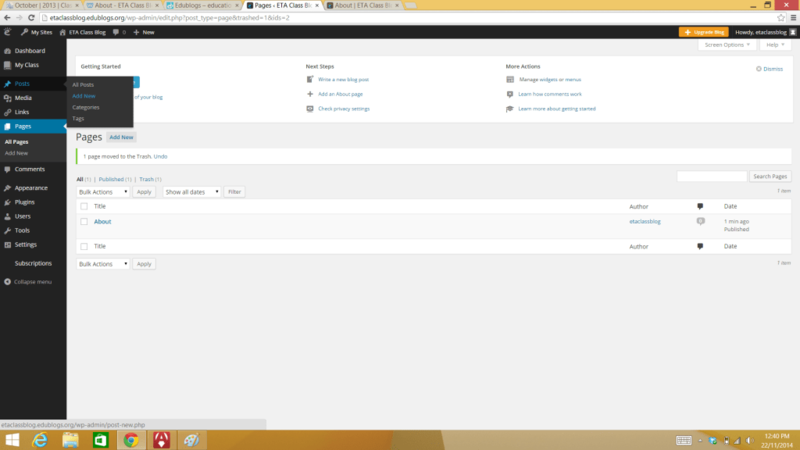 Click on “Theme Options”, also under “Appearance”, to choose the layout of your site. 5. 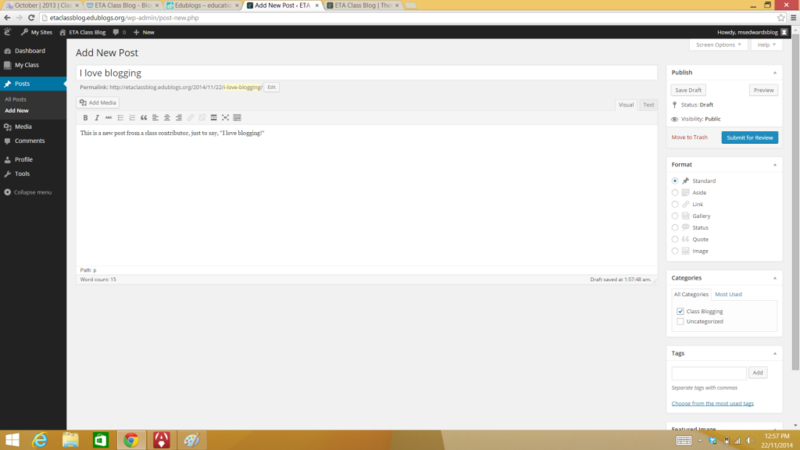 Click on “Pages” in the toolbar to create/edit the pages that appear in the menu under your header. Pages are the static sections of your class blog site. You might add an “About Us” page. Delete the sample page that comes as default. Add some text and media to your pages. 6. 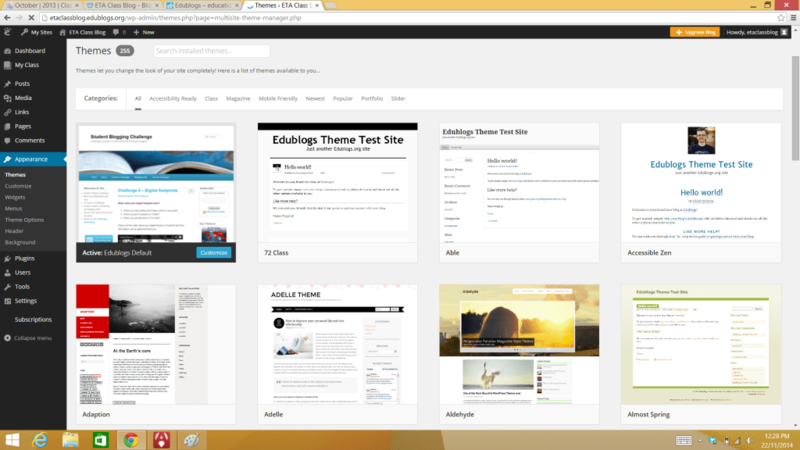 Set up your blog’s “Widgets” – these are the sidebar sections that will appear on each page of your blog. 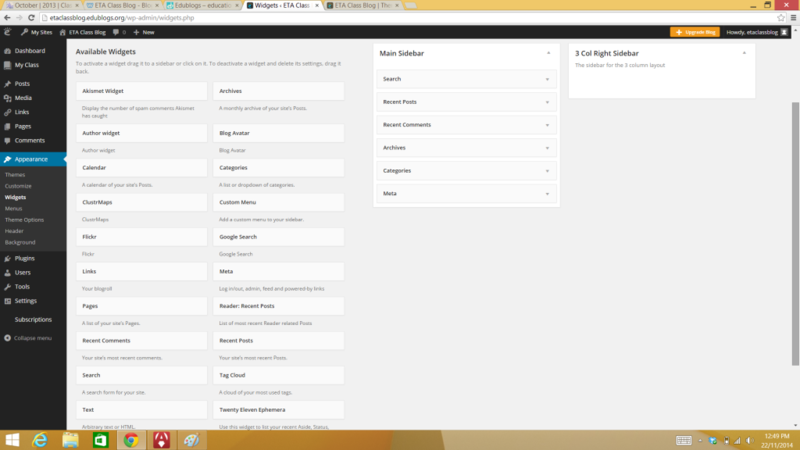 Click on “Appearance” in the toolbar, then “Widgets”. Drag and drop the ones you want. 7. 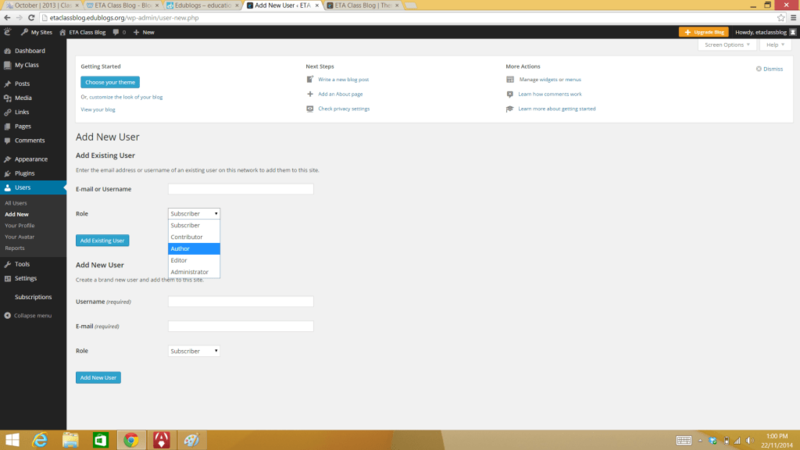 Go to “Settings” on the toolbar and set up how privacy, etc, works on the site. 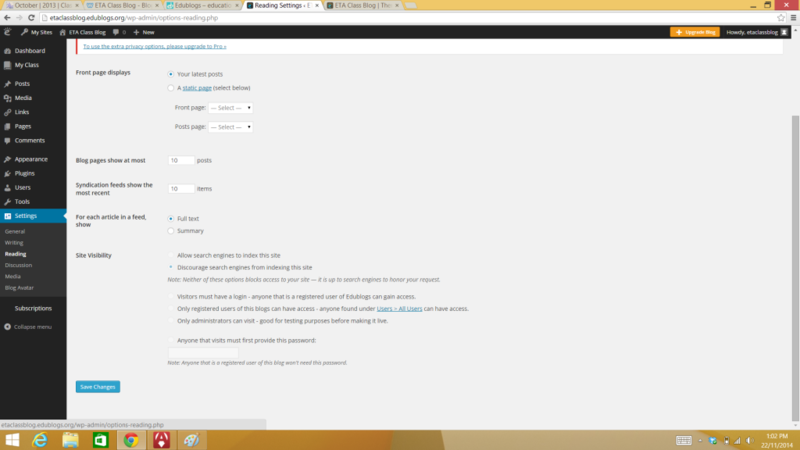 “Reading” settings can restrict who has access to your blog. 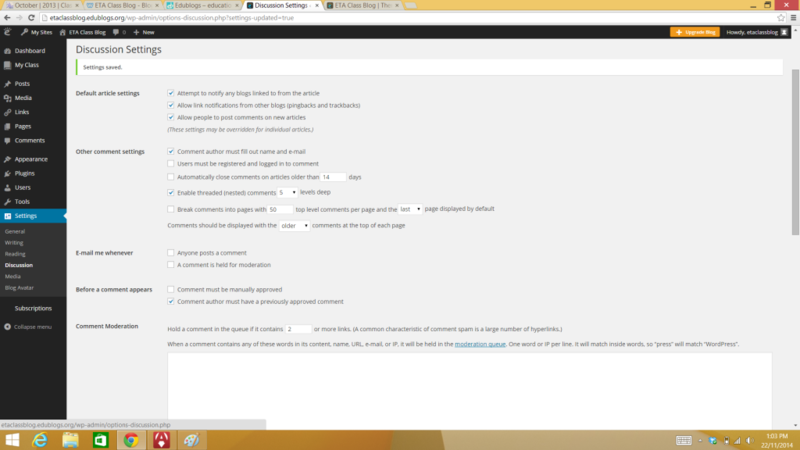 “Discussion” settings allow you to control how commenting on the blog works. 8. Add a first post to the page. Click on “Posts” in the toolbar to see a list of posts. Click on “Add New” to create your first post. Add text and media in the main window. Additional features are on the right. 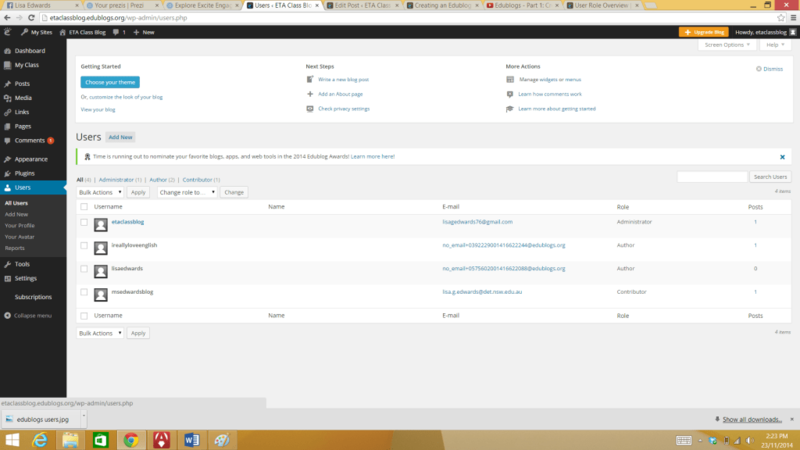 Create categories, add tags (assist others to find your posts in searches), and upload a feature image. Save your post as a draft, or publish. a. 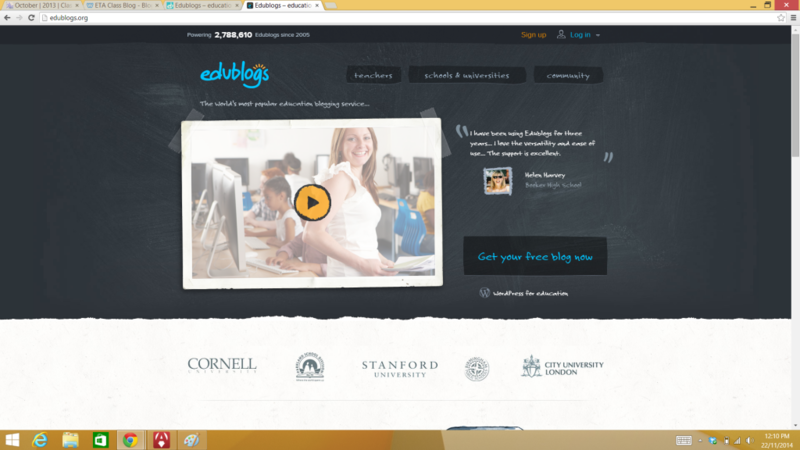 Students sign up by going to edublogs.org and clicking on “Get your free blog now”. They will register with a username and password and select that they are a student. Adding an email address is optional, but providing one is useful as it means there’s a backup if they forget their password. Creating anonymous usernames is a good idea to maintain the privacy of your students. 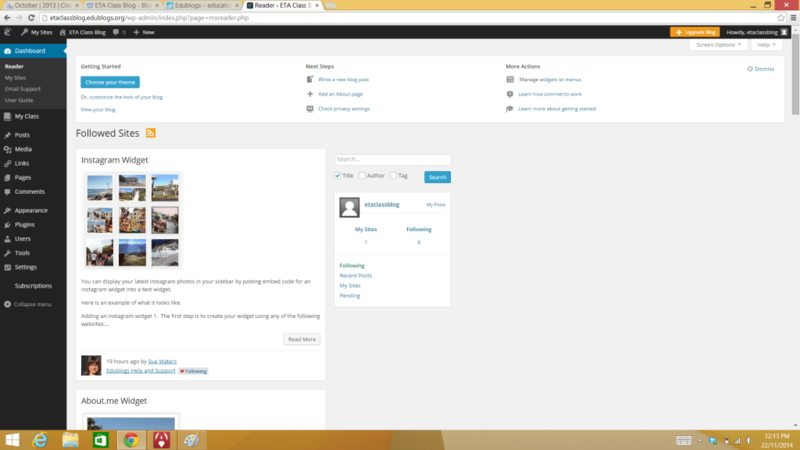 Students receive their own Edublogs site when they register. They should create a name for their personal blog, which should also consider privacy and not identify them by their full names. You may or may not want to have students writing on their personal edublogs as part of your class blog, but there is the option. b. Get a list of your students’ usernames. 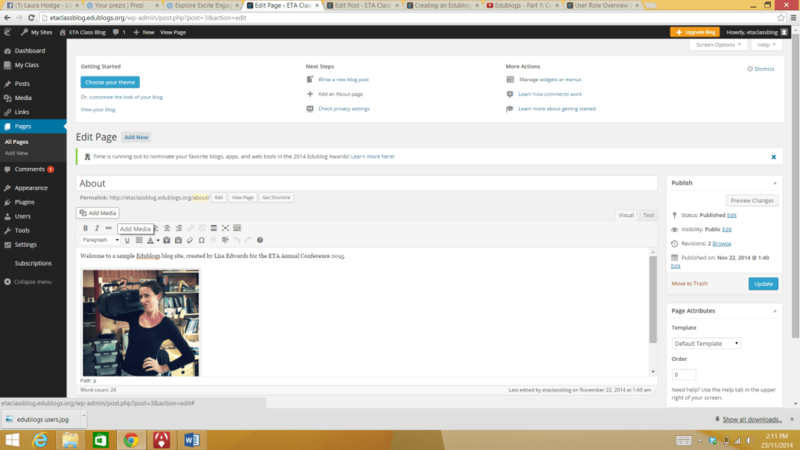 I have used the “Author” user type with my students, which means that they can publish their own posts. If you want to check the students’ posts before publishing, allocate them as “Contributors”. d. Now, when students log in and see their own dashboard, they will have access to two blogs: their own, and the class blog. 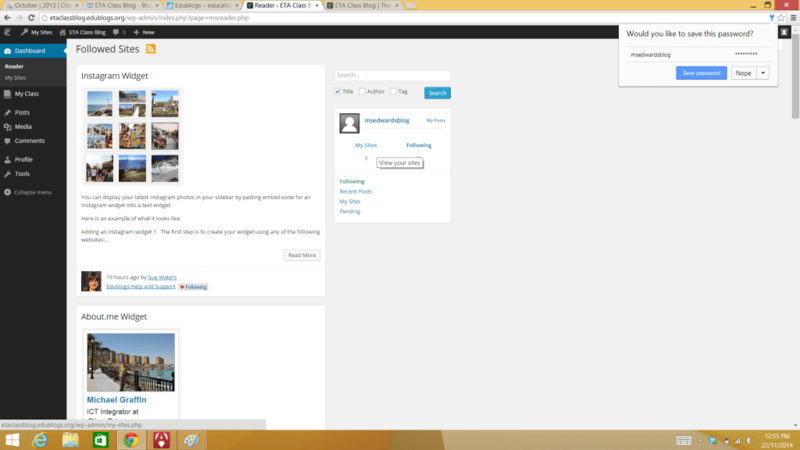 e. When you click on “Users” and “All Users”, you will see a list of all the students that you have added to the blog. 10. Keep playing around and get to know your blog. 11. Set students blogging tasks. 12. Provide time in class for blogging and commenting. I’ve got some more posts on the way with tips for class blogging and the educational benefits of blogging.